View Mapsforge offline vector maps. Is there a better alternative to Vectorial Map? Is Vectorial Map really the best app in Travel category? Will Vectorial Map work good on macOS 10.13.4? Vectorial Map allows you to view Mapsforge offline vector maps on different platforms, including OS X, Apple iOS, Android, Blackberry, Windows, and Windows Phone. Mapsforge maps are directly rendered on your device, do not require an internet connection, and can be easily customized (styled) using a simple XML syntax. Customize the map's look-and-feel using Mapsforge XML style templates and custom icons and symbols. 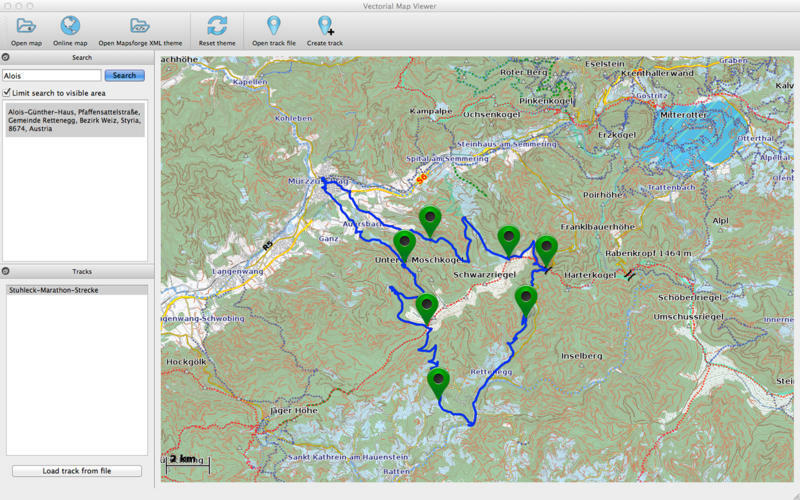 Plan and draw tracks and waypoints and save them to GPX and KML formats. Vectorial Map needs a rating. Be the first to rate this app and get the discussion started! Import GPX and KML/KMZ tracks and routes. Record GPS track on mobile devices.